Over 1-in-3 cancers diagnosed worldwide are linked to melanoma and nonmelanoma lesions. Due to increased routine exposure to physical (sun), chemical or biological carcinogens, these are anticipated to account for 3.3m cases by 2013 . Detection at early stage is critical to ensure high success rate for a cure. Novel spectral-based clinical instruments offer the potential for fast, convenient, non-invasive early detection, providing a valuable aid to the clinician and increased comfort to the patient. To this point the clinician has been dependent on traditional, invasive and slower histopathology screening. This article looks at some current developments. Fig 1: (a) detailed configuration. Fig 1: (b) OCT-Raman clinical diagnosis system. Raman Scattering (RS) provides a chemical signature of tissue which can discriminate disease state in a non-invasive manner. RS typically provides surface information, and has successfully been used to discriminate non-melanoma lesions, such as basal cell carcinoma (BCC) and squamous cell carcinoma(SCC), from inflamed scar tissue and normal tissue with a classification accuracy as high as 95 % . Deep tissue Raman techniques like SORS, have been used to transcutaneously detect bone tissue properties indicative of disease such as mineral and collagen composition, and to discriminate between Type I from Type II microcalcifications in tumor containing breast tissue . Optical Coherence Tomography(OCT) is a high-resolution sub-surface imaging technique which provides tissue morphology such as location and orientation of tissue features, but is unable to provide physiological or chemical information. The interpretation of OCT images is difficult and has had moderate success in the classification of skin cancers . A team led by Prof. Mahadevan-Jansen at Vanderbilt University has successfully discriminated BCC from inflamed scar tissue and normal skin using a combined OCT-RS apparatus . The instrument collects OCT images in real-time which can be used to guide the clinician to specific sub-surface features, where RS can be employed to provide specific chemical and physiological information. Accessing both morphological and chemical signatures is of clear benefit for very accurate skin lesion diagnosis. The clinical instrument (Fig. 1) consists of a combined RS/OCT probe mounted on a mechanical arm. 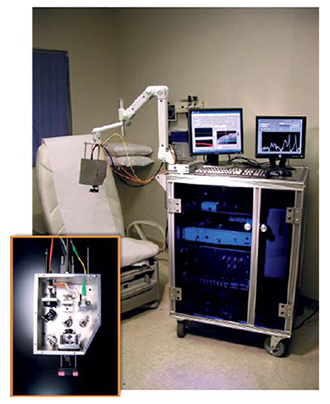 Optical fibers connect the probe to the RS and OCT detection subsystems, which are housed on a cart containing the PC running a dedicated graphical user interface. The probe contains a 785 nm, 40 mW Raman source, and the RS and OCT collection optics. The Raman excitation beam, resulting RS and OCT beams are co-aligned by two dichroic beam splitters. The coaligned beams are directed through an objective lens by a galvanometer, which is used to produce the OCT scan. 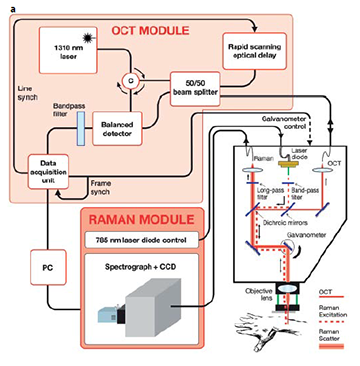 The Raman detection subsystem consists of the source control module, a high throughput spectrograph and a back-illuminated, deep depletion, thermo-electrically cooled CCD. The OCT detection subsystem consists of 1310 nm, 7 mW light source which is split by a 50/50 fiber splitter into reference and sample beams. The interference signal is detected by a balanced detector and subsequently digitized. The OCT system has an axial resolution of 14 μm, and can produce 15 mm wide by 2.4 mm deep mapping images at 8 fps. The Raman beam is focused to a spot size of 44 μm and to a depth of ~ 1mm. The system can provide a scan of a potential cancerous skin section in a few minutes and can scan an entire patient in approximately one hour depending on the frequency and location of skin lesions. 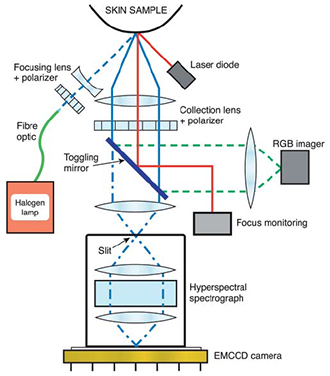 Fig 2: Hyperspectral imaging probe configuration. Work by a Japanese group  investigated pigmented skin lesions such as Malignant Melanoma(MM), using a grism based hyperspectral spectrometer with an EMCCD camera to capture hyperspectral data (Fig. 2). As part of this work they defined and tested a discrimination index applied to the hyperspectral data which enabled them to distinguish between MM and other skin lesions in a numerical and objective way. Hyperspectral data sets or ‘cubes’ have a full spectrum of the relevant wavelength region associated with each pixel element of the sample field of view. Nagaoka et al. imaged the sample areas of skin with lesions on to the entrance slit of the spectrometer. The high resolution spectrometer dispersed the light on to the EMCCD sensor so that spectral data corresponding to each spatial point along the length of the slit was displayed across the sensor, giving spectral information in one dimension and spatial in the other. The slit/spectrograph was scanned across the sample with the CCD acquisitions synchronized to capture data from successive line sections down the sample. The system had a 5 x imaging objective at the front which gave typically a 6 x 6mm image of the sample at the entrance slit plane. Data was collected at a frame rate of 30 fps for a spectral range of ~380 – 780 nm, with a spectral resolution of ~2.4 nm and a spatial resolution of ~13μm. A full hyperspectral image was acquired in ~20 s. A broad band halogen lamp illuminated the sample area and crossed polarizers were used to select the diffusely reflected light. MM, as evidenced with dermoscopy and histopathology, tend to show higher degrees of disorder and irregularity in melanin and haemoglobin densities, and variation in morphology compared with other skin lesions. Nagaoka et al. proposed a discrimination index which was designed to highlight such distinguishing differences between malignant tissue and other types of skin lesions such as seborrheic keratosis and Spitz nevus. Their algorithm determined the spectral similarity between the measured raw spectrum at a given point in the sample, and the reference spectrum from normal skin, resulting in a 2D “spectral angle map” for the full hyperspectral data set. Fig. 3 shows a standard dermoscopy image of a malignant melanoma (a) and the derived 2D “spectral angle map” (b). The final discrimination index was derived from the image entropy of the “spectral angle map” . In short the calculated index was a measure of the degree of variegation in the spectra; a high degree of variability from point to point in the sampled region showing up as a relatively high index and thereby suggestive of malignant tissue. 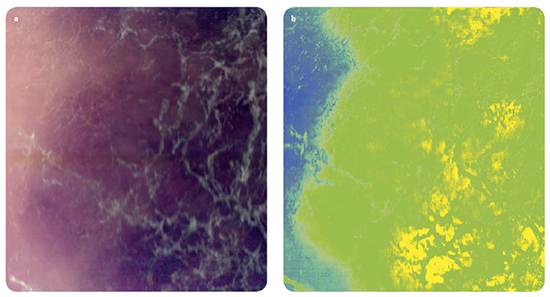 Fig 3: (a) RGB image of melanoma lesion with corresponding hyperspectral chemical map (b). The key advantages of hyperspectral imaging compared with conventional dermoscopy are i) a lot more information can be acquired(compared to RGB images), ii) the potential for real-time diagnostics and iii) reduction of unnecessary surgical biopsies and associated costs. A variant for capturing hyperspectral or multispectral data is to scan the wavelengths of interest with a tuneable liquid crystal or acousto-optic filter. Narrow spectral- band images are captured by stepping the filtered spectral band, as illustrated by Switonski et al. to carry out ophthalmic diagnosis of eye disorders. By providing rapid, in-situ, non-invasive high-resolution chemical and morphological insight into skin lesions, hyphenated instruments based on Raman, OCT or Diffuse Reflectance Hyperspectral Imaging are proving highly attractive screening tools for upstream identification of malignant lesions, thus limiting the number of unnecessary, invasive histopathology procedures. Success of this approach in a clinical environment will rely on robust computerized models for accurate, systematic and cost-effective diagnosis with high throughput screening capability(within minutes), while removing the need for advanced scientific input. The authors extend their grateful appreciation to Prof. Mahadevan-Jansen, Biomedical Engineering Department at Vanderbilt University, and Takashi Nagaoka-san at the Shizuoka Cancer Research Institute.